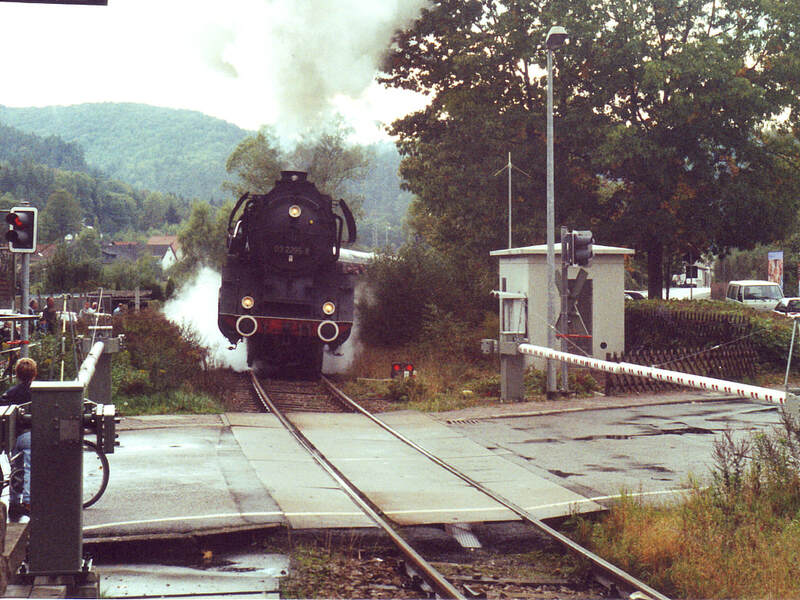 A 41 makes a spirited start towards Pirmasens from a very damp Waldfischbach on 2.10.00, admired by the locals. This turned out to be the last trip of 2000, and a very good one it was. 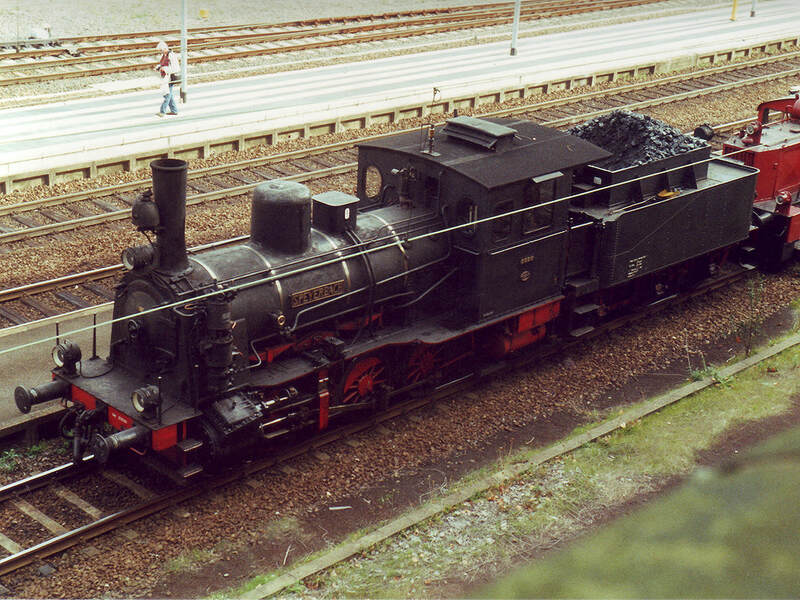 Rheinland-Pfalz had sponsored a major free (apart from normal fares) plandampf based around Kaiserslautern and Neustadt which required lots of heading of service trains by large steam locos. In addition this coincided with the Belgian TTB (train, tram, bus) day which normally involves at least one special trackbashing event. This year it was a shuttle service between Marbehan and the Valvert mineral water factory near Etalle, run by PFT with local authority support. Video seemed to be a good idea for the plandampf, and with a stop in Belgium required as well, the car seemed to be the best option. Accordingly the Turbo Tractor, a regular visitor to Belgium, had its first outing to Luxembourg and Germany. Very few photos as I concentrated on video. Massive quiz defeat last night [a strangely recurrent theme in my Friday departures] but we managed an 0650 departure for Dover with arrival at 1130 after delays in the Birmingham rush hour and a brief shop stop in Dover. The whole Norfolk line setup is friendly, helpful, laid back and excellent. Brand new Spanish ship, plenty of room, good nosh (shame about the NitroBods) and slightly early at Dunkerque. A l-o-o-o-n-g thrash via Lille (paralysed due to SNCF strike which ended this morning), Tournai, Mons, Namur to Rochefort where the Central Hotel (expensive, adequate) obliged. Rochefortoise Blond and reasonable nosh at Le Limbourg (pretentious, overrated by GBG) and Rochefort 8 at some hideous Bofferding outlet up the road. Whole place shut by 2200. In Belgium? On a Friday? Rotten breakfast. Central Hotel is somewhat mean spirited and I wouldn’t bother again. Nor with Rochefort, in fact. However, down at Marbehan, Belgium at its best with a cheerful mob from PFT and the local authority (Etalle) running a shuttle not to Etalle station as I’d thought, but to the Valvert mineral water plant on the outskirts of Etalle. This is a couple of miles beyond Etalle station on a ‘brand’ new branch opened in 1997. The original branch is still in situ, looks disused but maybe not. The new branch diverges south of N83, curves left through 150° to run north eastwards alongside N87, then curves right to cross N87 to the factory. The line splits with a single line west of the factory and two east of it. The shuttle went on the single line right into the factory and up to the end of track. Motive power was PFT’s 6077 and a 3 coach 1935 built SNCB push-pull set. This thoroughly excellent bash completed, we retired to (we believe) the GBG entry in Etalle, named Relais d’Etalle, not l’Ardennais. Wondrous plain ham sandwiches (‘tartines’) with wholemeal bread, and Westmalle Tripel. Onwards then to Luxembourg (diesel 44p/litre, 81 at home) Trier and Pirmasens where the Hotel Landauer Tor was located without difficulty. [In 2008 with diesel at 111 and oil prices seemingly completely out of control, even 81 looks pretty good!] What a place Pirmasens is, and virtually dead even at 1900 on a Saturday. We eventually got a very nice meal in a Greek restaurant near the hotel, after getting soaked trying to find something more to my taste. Breakfast at 0800 - much better in Pirmasens! - before departure by car for Dahn with a view to videoing ‘Speyerbach’ on its way down. A lack of photographers alerted us to a possible problem, and on arrival at Bundenthal-Rumbach there was no kart waiting (it was supposed to depart at 1035 following arrival of the steam train at 1032). [One day I suppose I'll see Speyerbach in steam but (2008 again) all attempts so far have failed (2018 - did manage haulage in the end!) ]. The kart eventually appeared in the path of the steam train so we took a quick video clip and retired hastily to B-R for a ride up the branch to Hinterweidenthal Ost which was satisfactorily done, the branch platform being on a loop off the main line. Two 01s stopped before the kart departed, both with 4 coaches absolutely packed. Because of late running by the 01s the kart was late back at Bundenthal-Rumbach. After grabbing a coffee in the caff we tore over to Landau Hbf in the car, arriving with about 3 minutes to spare for 1338 to Winden. Winden was just as bleak as when previously visited but fortunately 1352 to Landau (a 218, ex Wissembourg) was slightly late so we were spared a long wait at Winden and got back to Landau in time for a quick bier und bratwürst in the station buffet. The 1440 to Pirmasens Nord and Kaiserslautern appeared with its 01 while we were still in the bar and we had to decamp hastily. The Pacific proved very capable - quick to get away and seemingly running very freely. A very entertaining run was had, and I suspect the late running was due to the large numbers of people and not the (relatively lightly loaded) locos’ failure to keep time. At Kaiserslautern a beer and hot chocolate (for the driver) break in the very depressing buffet was taken, there being no pub visible nearby. The 1737 to Bingen was one of the wretched articulated units with ro’ck ‘ard seats, all of which were taken. We detrained at Enkenbach once I was happy that the junction with the direct line from Kaiserslautern and the one via Hochspeyer was south of the station (it is, and in a single line). We had come via Hochspeyer this time. The onward journey to Landau was on the dated SuO 1820 to Karlsruhe, originating at Koblenz, which does the east curve at Hochspeyer. Very satisfactory too, and a Rabbit to boot. 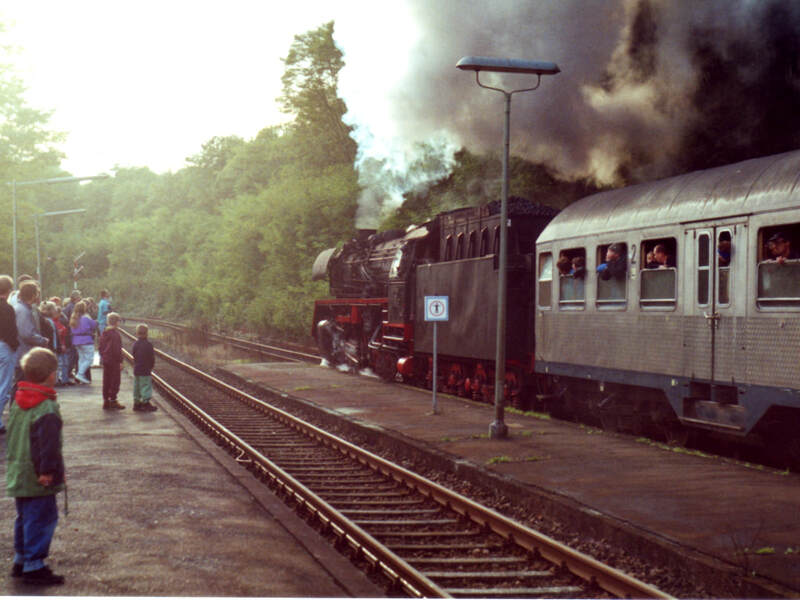 03 2269 heads up the hill out of Münchweiler on 2.10.00. Breakfast appeared to be on the way out at 0815, but filled a gap before we headed to Rodalben where the 0919 from Pirmasens Nord was (just) videoed. A kindly local conducted us to a suitable phot spot for the 0939 northbound and after further discussion he led us to Waldfischbach on his way to Kaiserslautern. We were able to deal with the 1100 southbound at Waldfischbach and then 1200 northbound at a point on the main road just south of Waldfischbach. We then retired to Rodalben again to deal with the 1323 southbound and 1339 northbound. Before this we scoured the town for pubs (none reasonable and open), ending up with Brie sandwiches from the local bakery and Küpper’s Kölsch (very nice) at a slightly unusual bar in a restored building of note. Onwards to Münchweiler for the 1530/1530 pair. The local morons were well in evidence here and contrived to get in the way quite effectively. That said, it also has to be said that as a foreigner attending a free show at the expense of the local taxpayer, I feel bound to put up with this without being objectionable. I wish that some of my fellow countrymen would do likewise. Retiring to Schopp to look at video locations, we caught up with 01066 again northbound but didn’t have time for a phot. Schopp looked a bit poor so we retired to Waldfischbach for the 1700 southbound, video being totalled, I suspect, by local taxpayers. Slightly deflated after this display we returned to Pirmasens without finding anywhere to eat. In a rare moment of clarity I asked the hotel receptionist who said Hopfen Speicher just up the road in the pedestrian precinct (by Müller’s store) was the business. So it was too - Paulaner hefeweizen on draught, excellent food, very affable English speaking waitress, plenty of customers and no music. Wonderful. Back to the Landauer Tor for 2100 after a really excellent day. Written well after the event, a sketchy account. We drove to Neustadt where the queue for the Kuckuckbahn looked hopeless so retired to a point 3 or 4 km west where we were able to video the KK-Bahn train (0-6-0T, open verandah 4-wheelers and a diesel ‘banker’) and two of the main line steam trains. After a refreshment break, a long, long drive to Aalter, where the hotel previously used obliged once again. Thence by train to Brugge for a couple of beers at De Garre. Not to mention cheese, of course. No trains today, but drama at De Panne with the beer warehouse closed all week. Krombeke obliged, as did St Sixtus, and lunch was taken at the wondrous new In de Vrede before returning home. The Norfolk Line ferry was very late after a circuitous/zigzag route across the Channel avoiding heavy traffic! Home by 2300 though. After this intensive autumn spell I had another break, eventually being lured back to Germany when Ryanair offered a remarkably low fare to Lübeck early in 2001.